If like me, you haven't already set yourself up for the coming season, now's the time to make sure all your favourite lures are ready to go, the moment the fish are in. For hard bodied lures (plugs) that usually means checking all the hardware for signs of corrosion, bluntness or weakness. 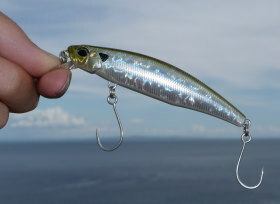 While I normally replace any iffy trebles with the excellent Daiichi Bleeding Bait treble hooks, at the end of last summer I started to play around with single hooks on some of my lures. After reading conflicting views on various fishing forums and blogs, I wanted to make my own opinion. At this point in time, I can't conclusively say they increase hook-ups and catch rates, however I didn't feel disadvantaged in any way. I can't remember a single fish being foul hooked using single hooks and as I'm not a commercial fisherman, that doesn't bother me - in fact I'm pleased - I'm always a bit disappointed when an amazing run turns out to be a foul-hooked fish. It's not my place to bleat on about fish welfare to you either - you'll have your own view I'm sure. In my case, seeing that I've injured a fish I plan to return is a negative experience. You know the situation - you hook a bass in the mouth with the belly hook and the tail hook swings around in the fight, leading to injury. If luck's on the fishes side but not yours, it's equally possible that on landing the fish that spare treble will find its way into you - it happens! I'm not a hippy (not that there is anything wrong with that). But in this day and age I find myself almost ashamed to say, I like to fish a barbed hook. I understand the reasoning behind removing barbs and as I've already said I am genuinely downhearted if I inadvertently injure a fish - but having a barb, a small barb, gives me confidence - and having confidence catches me more fish. In some ways, fishing single hooks (with barbs) on my plugs is about making a healthy balance between catch-rate and conscience. So far, results are good on both counts. Okay, confession over. This is supposed to be a tackle site after all - on to the hooks in question. 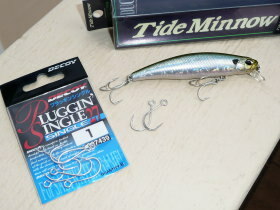 I am using the excellent Decoy Pluggin Single hooks in size 1. I don't use excessively large lures these days. I have found these work admirably as replacements for trebles sized around 4 and 6. These hooks feature a big gape which I like. 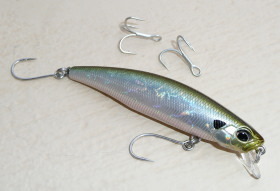 It feels to me that on the belly positioned hook, the wide gape positions the hook point away from the lure body, when the lure is moving forward. When suspending, the vertical hanging hooks will reach a similar position to a standard treble. With the belly hook point facing forward and the tail facing backward, I don't feel disadvantaged at all. Another key feature is the over-sized eye formed at a right-angle compared to a traditional eye on a fishing hook. The oversize hoop allows for fitting to the essential split-ring. The peculiar position of the eye is necessary to align the hook correctly once attached to the split-ring. Even if you could fit a standard hook over a split-ring, you would need to add an additional ring to correct the alignment. The big question about replacing original hardware with hooks like these Decoy Pluggin Singles is over lure balance and action. I spent a lot of time reading and researching the matter when I first got into plugging in Australia and in summary, I don't think many people want to make it a science - leave that to the lure manufacturers and get on with your fishing. Treat every lure case-by-case. Test each lure. It will help if it is a lure you've used extensively before. If the lure still feels right then it will most probably still catch - it may even work better. If a lure feels wrong, don't risk killing the action of a favourite lure. If you've come around to how deadly a suspending lure is, then test this too - you may have affected the overall buoyancy - positively or negatively. Don't use the bath if you normally fish in saltwater! If you do want to get all technical over balance, you can buy adhesive, weighted strips or pads to re-balance your lures. In summary, my results aren't yet conclusive. In terms of catch-rate I haven't identified any tangible increases, however I don't feel disadvantaged and am willing to start this season with them among my 'regulars'. After all, more and more of my fishing is moving over to soft plastics and I only ever fish a single, single hook! Decoy Pluggin Singles are available in sizes 8 to 2/0 (the smaller sizes are perfect for small jigs too!). You get 8 per pack and it is clearly stated they are suitable for saltwater applications. I acquired mine from MonsterTackle.co.uk where they are currently priced at £5.99 per pack. I've only ever seen them in a silver finish. Decoy is a brand I really trust having used a number of their products before. Amazing quality. 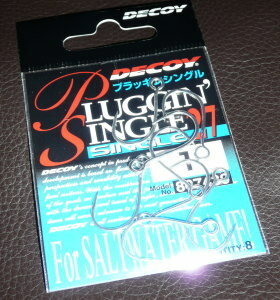 Buy the Decoy Pluggin Single Hooks for plugging from Monster Tackle. Trusted seller. Visit now!